I feel like I’ve been everywhere with Salomon shoes; I’ve hiked a mountain, run trails, completed a GORUCK Challenge with them and even walked 34 miles in a 20-hour period during the 2012 Carry The Load Event. While this certainly wasn’t all in the same pair, I’ve been wearing Salomon shoes for 3+ years, purchased 6 pairs and logged quite a few miles. 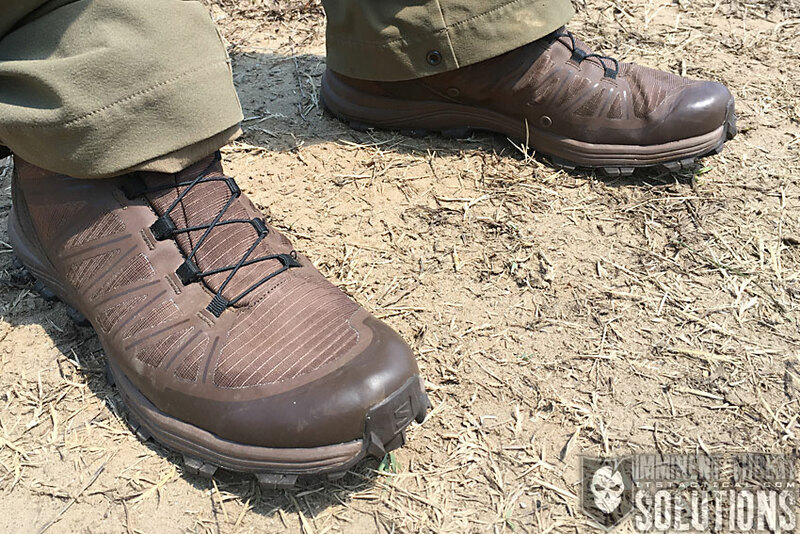 My goal with this article is to speak honestly and help you make a more informed purchase decision, should you want to purchase Salomons for yourself. It’s written from my personal experience and your mileage may vary. My first foray into Salomons was a few years ago, after they were recommended to me by a good friend that had just returned from a deployment to Afghanistan. I’d heard about Salomons before and had even tried on a pair at my local REI. My hesitation, before my friend’s recommendation, was that I didn’t think the laces would hold up. They were thin and designed in such a way that it would be a pain to replace them if they happened to break. Don’t get me wrong, I loved the shoes and thought they were incredibly comfortable, I just didn’t trust the laces. 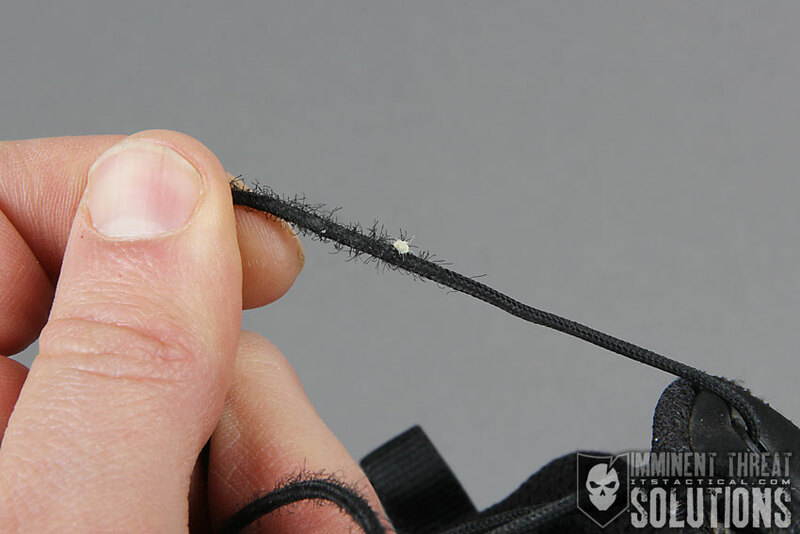 As I discussed my friend’s experience wearing them exclusively for an entire 6-month deployment, the first question I brought up was about the durability of the laces. He said he hadn’t had a single issue with the laces breaking, nor had any of the other guys from his platoon that were wearing them. 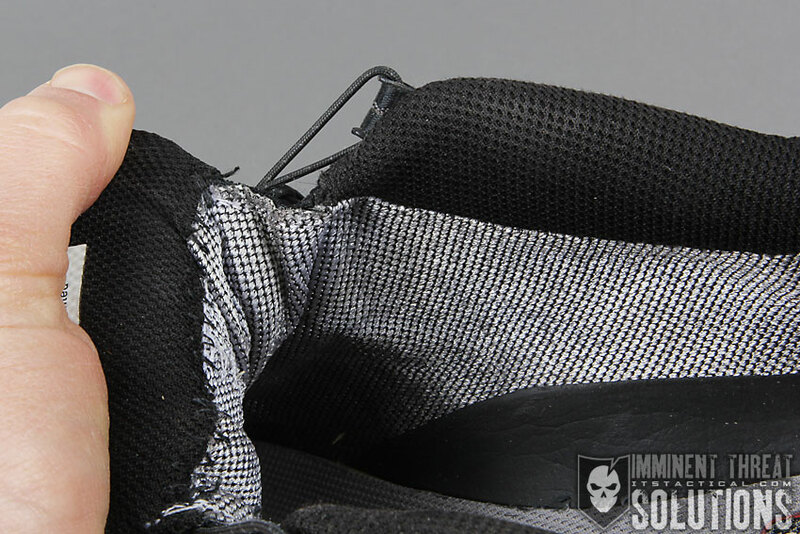 That intrigued me and I soon found out that they were made of Kevlar. If you’re not familiar with the strength of Kevlar, it’s the same material we include in our Urban Kits to friction saw out of Zip Ties, should you become illegally restrained, but I digress. 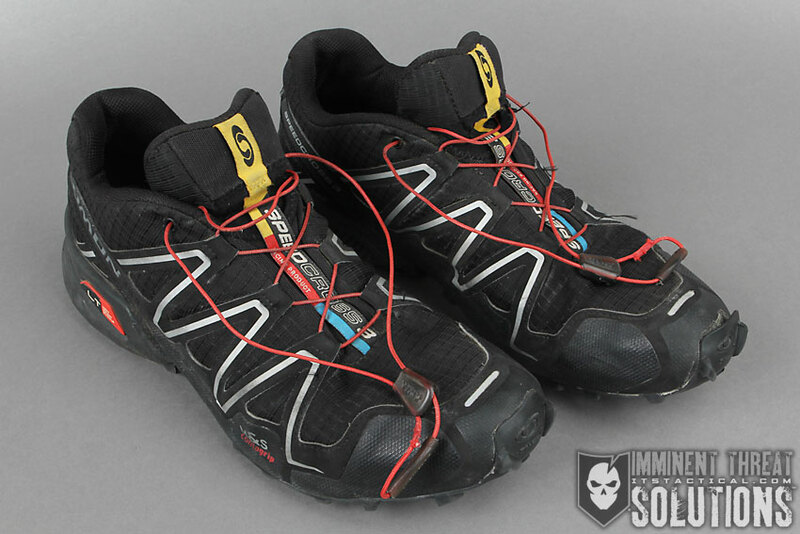 The laces were no doubt strong and definitely put my mind at ease about my initial roadblock to purchase Salomons. I chose a pair of Speedcross 2 shoes, which pre-date the currently available Speedcross 3. I wore them everywhere when I got them; running, out in town, you name it. I was loving them, that is until the outsole (or tread) started wearing down quickly. If you’ve ever had experience buying running shoes and been properly fitted for them, you’ll know what I mean when I say that I have normal pronation, or that my foot makes pretty even contact all over. 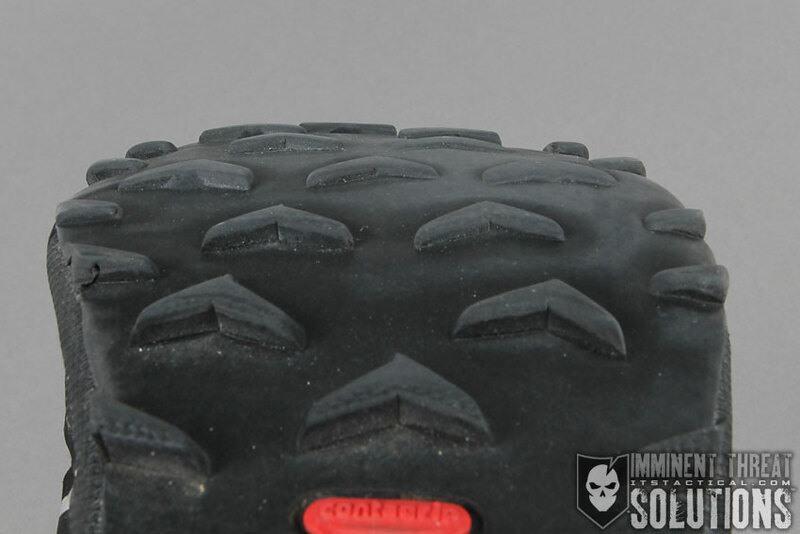 I only mention this to point out that my wear pattern on the tread doesn’t wear more on one side than the other. That being said, I found the Speedcross 2 to be wearing faster than I’d normally had running shoes wear. As any good runner knows, running shoes are running shoes and not daily use shoes. You should have another pair for daily use. 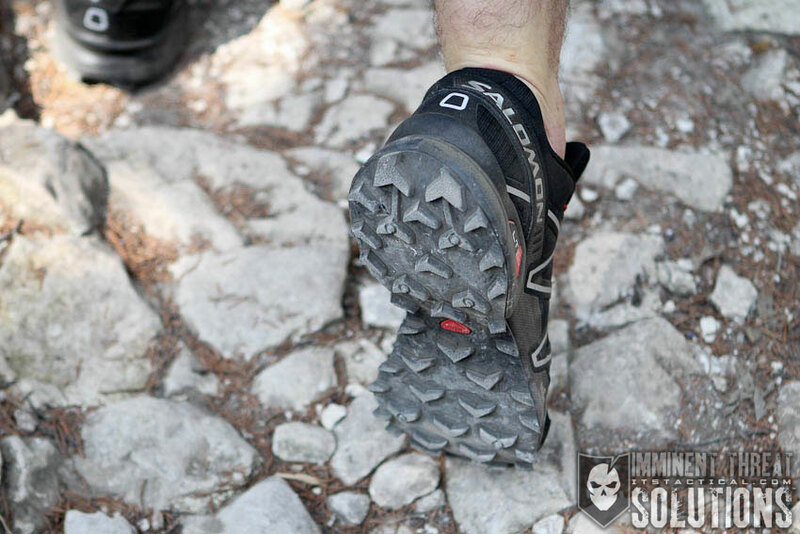 I was certainly guilty of wearing my Salomons for everything and I knew it. It had been about five months and I could feel the pavement a bit too much for my liking and knew it was time for a new pair. Before I move on in my Salomon journey, I’d like to point out the other features of Salomon Shoes that I’ve neglected to mention. The line that the Speedcross 2 and all the Salomons I’ve purchased belongs to, is their Mountain Trail line. 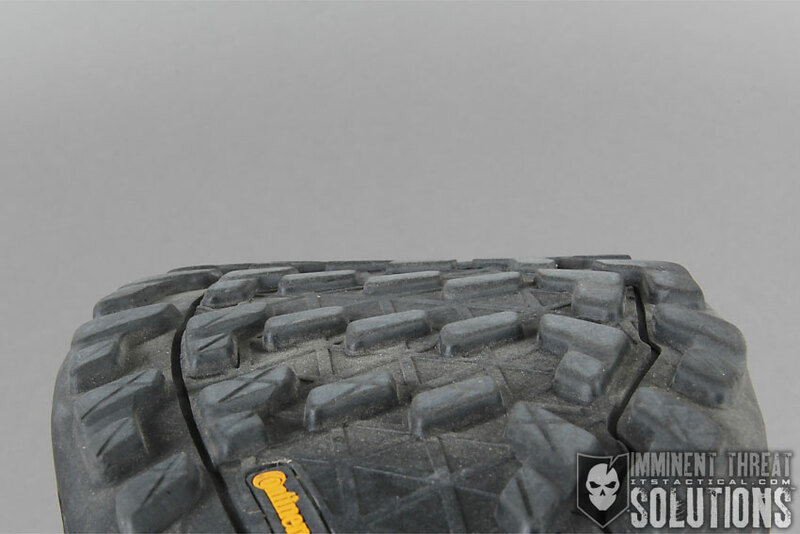 These are primarily described for increased performance on trails. More on this later the article. I’d also like to describe their lace system, which is unique and one that I really like. As you already know they’re made from Kevlar, so let’s focus on the Quicklace System, described as a “minimalistic and strong lace for one-pull tightening. Easy-on, easy-off.” You grasp the lace cover, a rubberized piece that hides the spot where the lace is stitched together and pull. 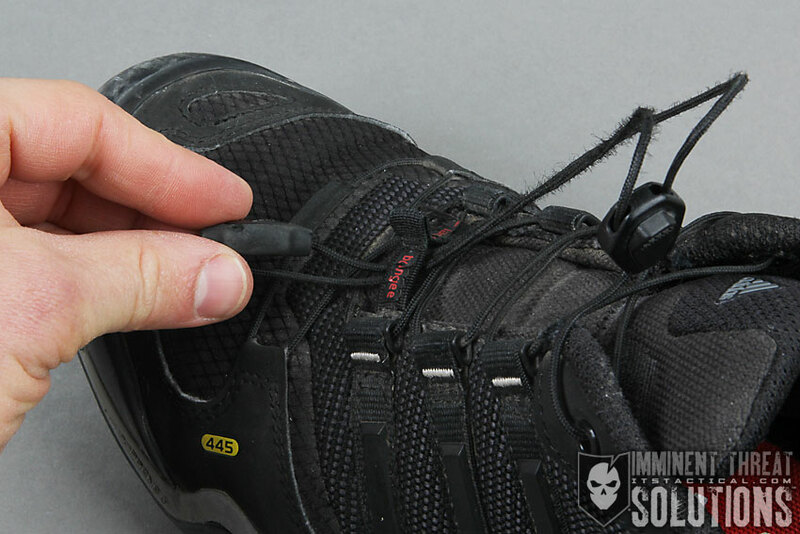 Then simply pull down towards your foot with the toggle to lock the lace into your desired tightness. You then take the extra lace and stuff it into the lace pocket, a mesh opening on the upper tongue. 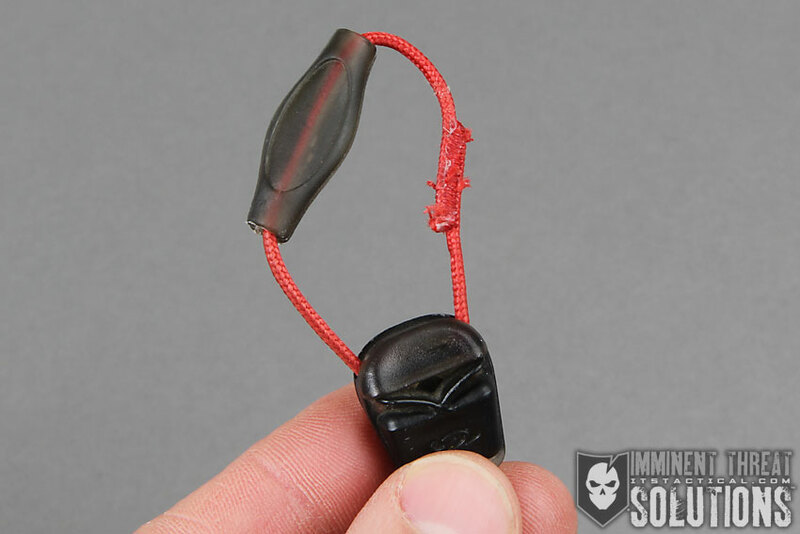 To loosen the system you simply pull up on the toggle, releasing the “lock” on the lace. 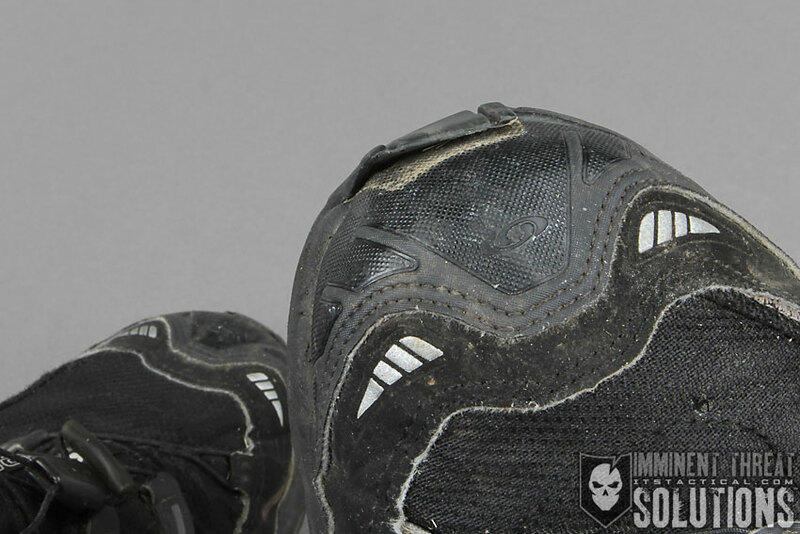 On all three pairs of Speedcross shoes I’ve purchased, the rubberized piece that hides the spot where the lace is stitched together has slipped off and rode down the lace. This doesn’t seem like a big deal, but when it’s not in the optimal position and I’ve gone to grab the lace to tighten, it’s caused the lace to favor one side over the other for tightness and caused me to readjust. On my second pair of Speedcross shoes I wound up finally putting superglue on the lace joint and sliding the rubberized cover back over to fix the problem. Not a huge deal, but worth mentioning. 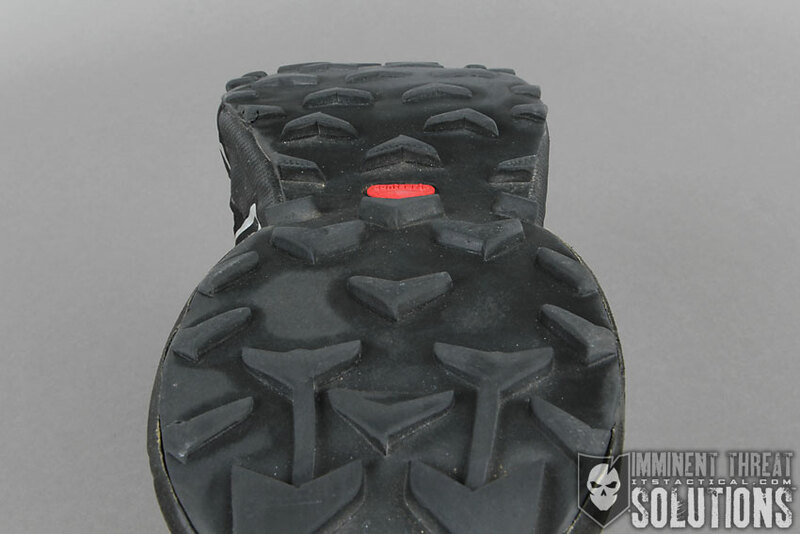 As I mentioned with the outsole wearing out above, this wear has also affected the toe of the Speedcross shoes. 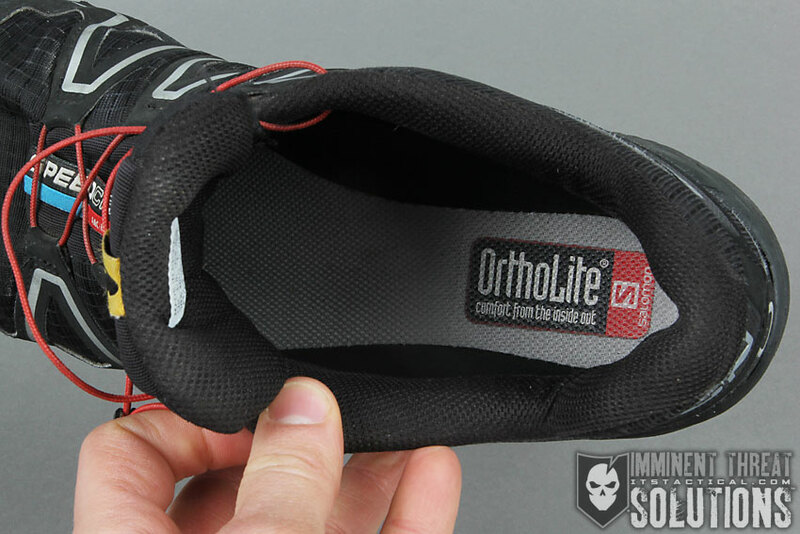 The outsole wraps over the toe and creates a toe cap for extra protection. Four out of the six pairs of Salomon shoes I’ve bought have had this area come unglued and start flapping within the first two months. Nothing a little Shoe Goo wouldn’t fix, but still something to bring up. Each pair I’ve had has also featured an OrthoLite Sockliner that creates a “cooler, drier, healthier, better cushioned environment under the foot. It won’t break down or lose effectiveness over time.” I’ve found this statement to be fairly accurate, but they do hold stink pretty well. I don’t consider myself as someone that has “stinky” feet, but after time I wind up needing to wash these out more so than any other brand of running shoes or everyday wear shoes I’ve ever owned. I’m not sure if its the OrthoLite that causes this or not. 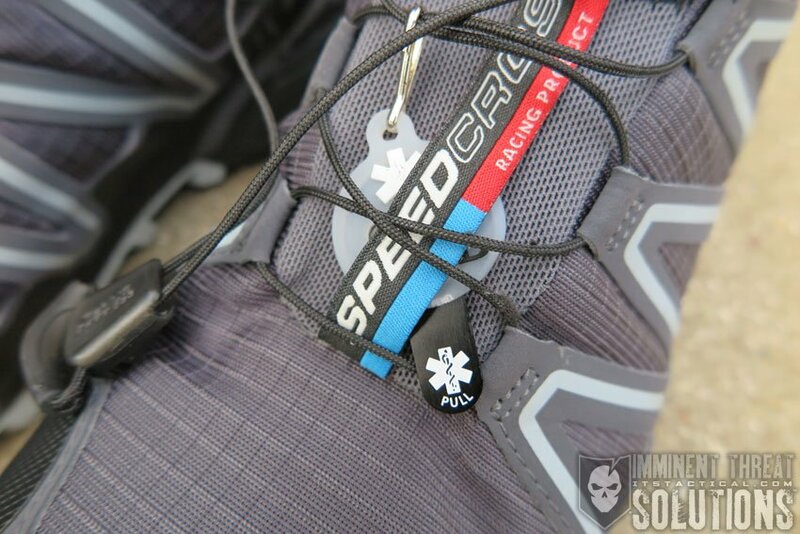 I’d also like to mention how lightweight the Speedcross Salomons are, as a pair they weigh about 24 ounces. 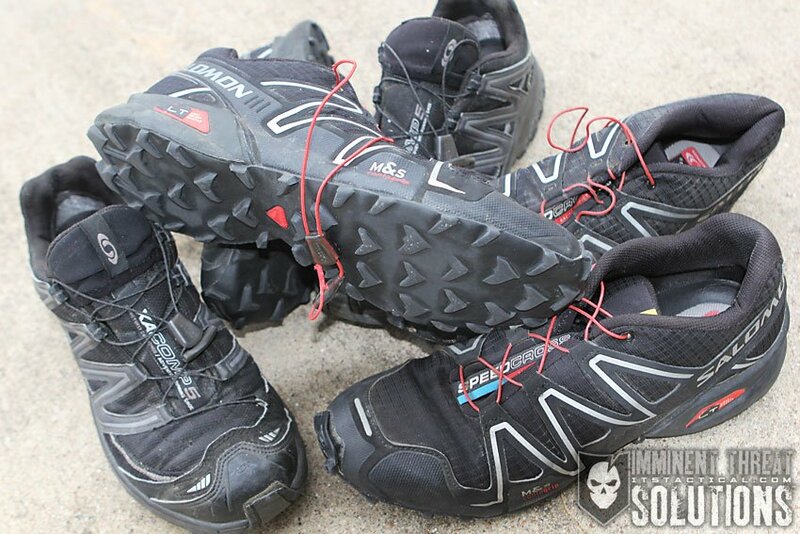 The other pairs of Salomons I’ve owned are a bit heavier, but I’ll list specifics when I get into those models. They also dry out fairly quickly, should you submerge them in water, like I had to during the GORUCK Challenge. I remember it taking about an hour to run them dry. 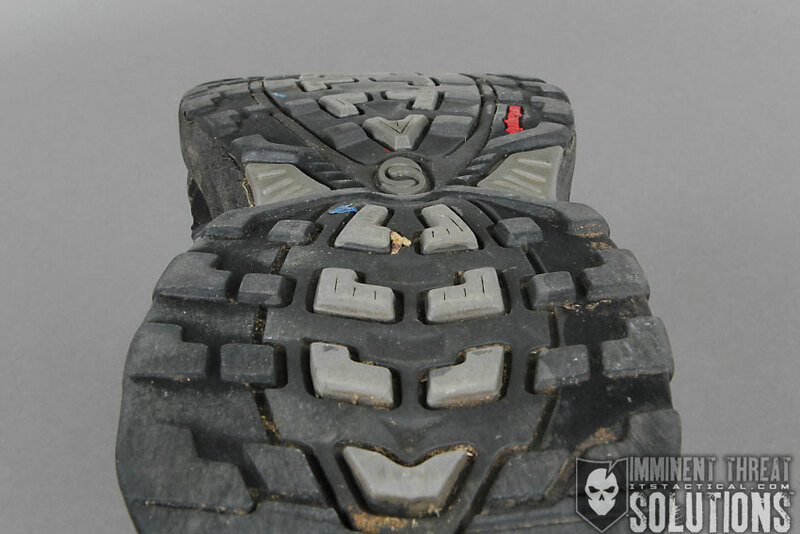 After my first pair of Salomons wore out, I researched the Salomon line a bit more and settled on a shoe that seemed to have a thicker outsole with a more aggressive tread. I thought that this was a good move, considering there would be more there and would therefore last longer. I settled on the XA Pro 3D Ultra GTX, the GTX standing for Gore-Tex. They’re described as having “a unique blend of light weight, durability, stability and protection for running and fast hiking on rough terrain and technical trails.” It’s also quite a mouth full for a product name. With this pair of Salomons, I vowed to use them solely for running and PT to increase their life expectancy. Despite my best efforts, I made it about six months of running a few times a week and working out the other days before the tread wore out. 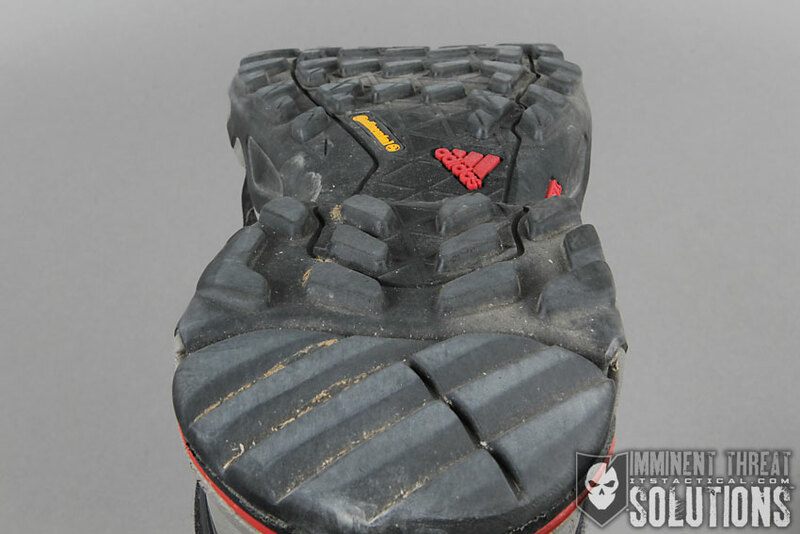 I also found that the Gore-Tex was making this pair stink even more than the Speedcross 2’s, at least that’s the only thing I could think would be causing that. I then decided to move to the non Gore-Tex lined XA Pro 3D Ultra shoes, figuring I’d give them another shot without the Gore-Tex. Another six months and they were done for. Something I mentioned earlier is that all the Salomons I’ve bought have been from their Mountain Trail line and made for trail running. I wasn’t doing much trail running. A little, yes, but my running was primarily on concrete and asphalt. My point in saying this is that it was in the back of my mind as a reason I might be burning through Salomons so quickly. I will say this, I’ve never been a huge runner, but I’d never had a pair of the Asics I was buying before Salomons wear out as quickly as the Salomons were. The Salomons were certainly more comfortable and are what kept me in them, rather than go back to Asics. I was getting about 9-10 months out of Asics before I needed a new pair. Enter Salomon pair number four, again I bought the non-GTX XA Pro 3D Ultra 2. The two meant they were now in generation 2 and again I was optimistic they’d made changes for the better. I’d like to mention here that with the XA Pro Salomons, I didn’t have that lace problem that I’d experienced with the Speedcross shoes, but I was still getting the toe issue peeling away though. The pair of XA Pro Salomons weighed in at about 30 ounces in both GTX and non-GTX. It may seem strange that I was logging my time in these various pairs of Salomons, but I honestly wasn’t really doing a good job of that. I am, however, good at saving receipts and when going back to write this article I was able to look up when and what I’d purchased for shoes in the past few years. That and I still have the majority of my worn out Salomons. I tried logging actual mileage I was putting into the dedicated pairs for running and working out, but it’s not accurate enough to quote here. 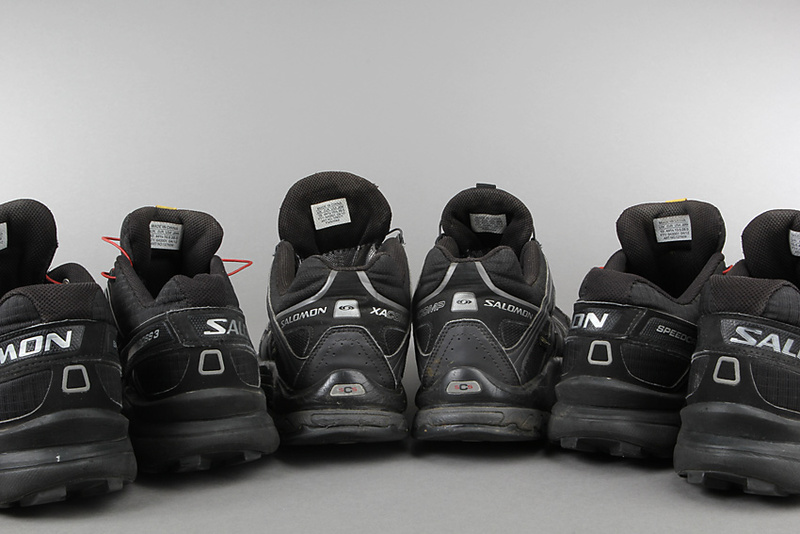 I’ve thrown half of my pairs of Salomons away over the last few years but still had three pairs to use to photograph for this article. 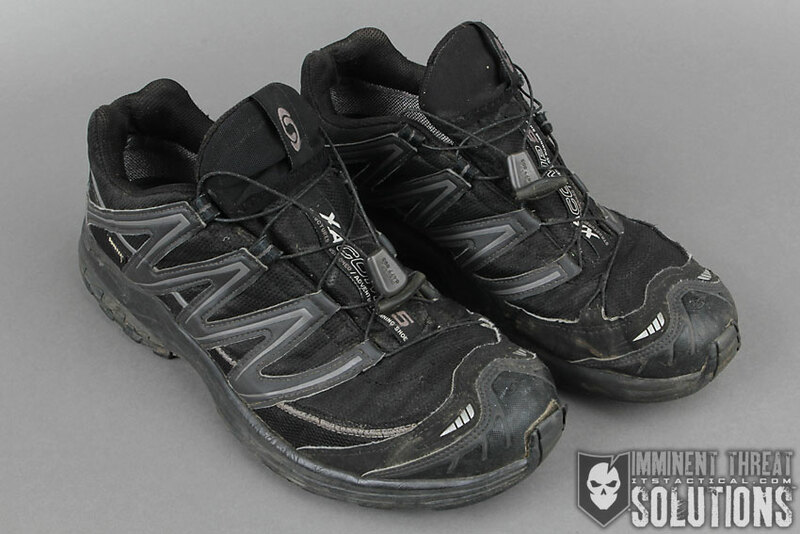 The outdoor photos you see of the Speedcross 3 shoes are what I’d like to touch on next and were shot when I’d just purchased my first pair of Speedcross 3’s few years back. 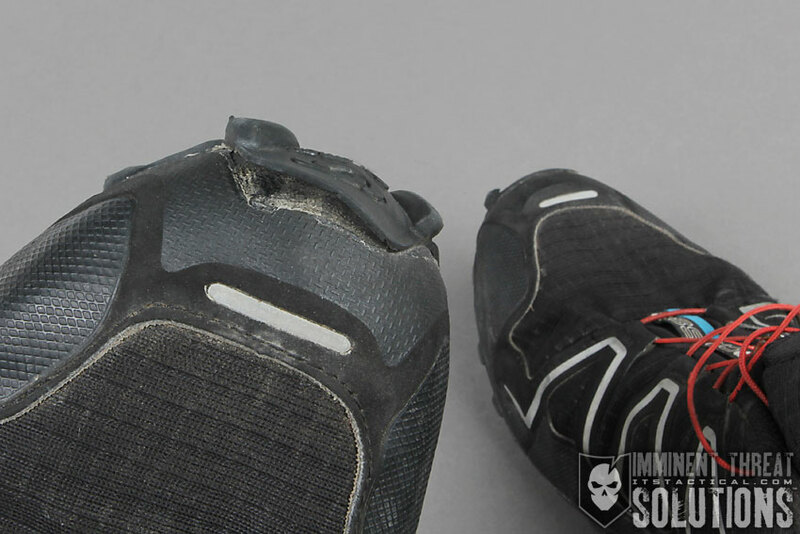 After my second pair of XA Pro Salomons wore out (again in six months) I noticed that the Speedcross 3 had been released and hoped that they’d fixed the issues that were annoying me and subsequently that they had some feedback on the outsole and beefed it up a bit. Much to my disappointment, this wasn’t the case. They were nearly identical to the Speedcross 2 and after some time I had the same lace issue, toe peeling issue and outsole wear. 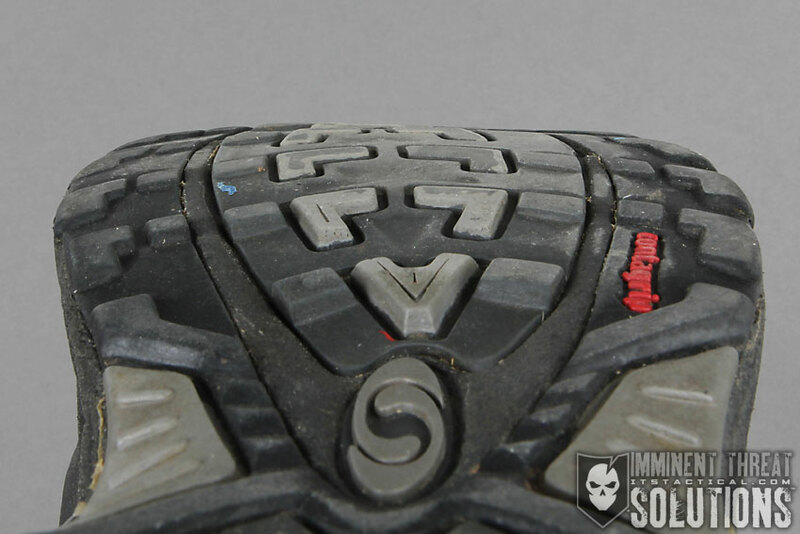 Something else that I began noticing more in the Speedcross 3 was that the laces started squeaking and creaking. What I mean by this is that as I’d take a step and pushed off from my toe, I could hear the laces move inside the eyelets. I certainly wasn’t going to be sneaking up on anyone like that, so I tried using some wax and putting it where the lace ran through each eyelet. This seemed to work well, but after time would go back to creaking again. I did this about twice in a month and then gave up. I will note that the XA Pro’s have a plastic insert on the eyelets and I didn’t notice that they had this noisy lace issue. I tried to make Salomons work for me, honestly I did. As a last ditch effort, I even bought a second pair of Speedcross 3’s and had a daily wear pair with my worn down pair and used the second pair for running. Mike even commented a few years ago at SHOT Show that he thought it was ridiculous that I brought two identical pairs of shoes with me. One to workout in and one to wear each day on the show floor. You may be thinking to yourself that you would have given up on Salomon a long time ago with the issues I was having, but I truly loved the comfort and that was outweighing the other problems. Keep in mind that the six pairs were over about three and a half years, so it wasn’t as bad on my bank account. I also believe in having the proper equipment for working out to avoid injuries, even if it means an investment. I’ve been Salomon-free for exactly six months now and have moved on to the Adidas Outdoor Terrex Fast X shoes. 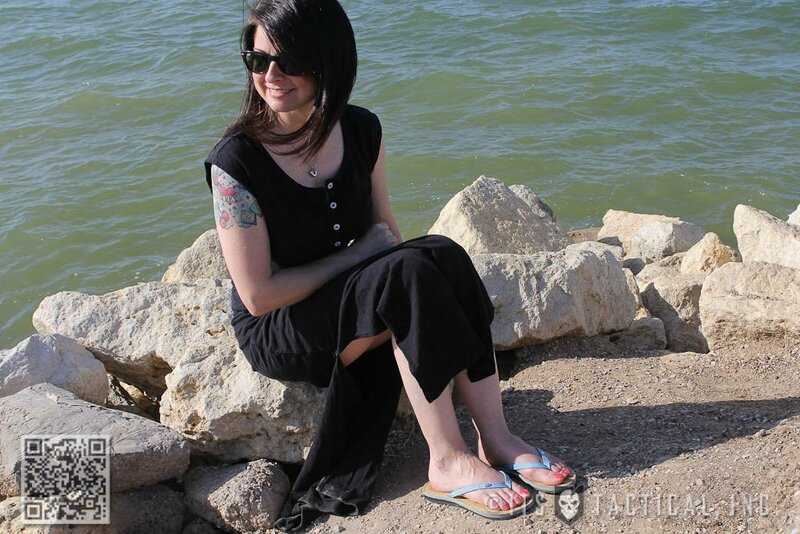 I wanted to ensure I’d been wearing them for at least six months before I added them to this article and gave my thoughts on them. Overall, I’m happy with them and feel they’re still comfortable like the Salomons are, but just not quite as comfortable. They still feature the OrthoLite Sockliner like Salomon uses, which is why I feel they’re still comfortable. As opposed to every pair of Salomons, I felt the Adidas Terrex shoes needed more break-in time out of the box, where the Salomons were ready to run in immediately. 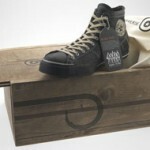 The biggest benefit has been the outsole wear, or lack thereof. Six months in Salomons and the tread was nearly worn down, whereas with the Adidas, you can see in the photo below that there’s still plenty of tread left. I’ll update this article when I wind up needing to replace them, but I’m betting I get another few months out of them. I’m also trying my best to use these just for working out, but I have been guilty of wearing them daily more times than I’d like. While I don’t have the issue with the laces from the Speedcross shoes, a few new issues have popped up. First off, let me explain the Adidas speed lace-up system. 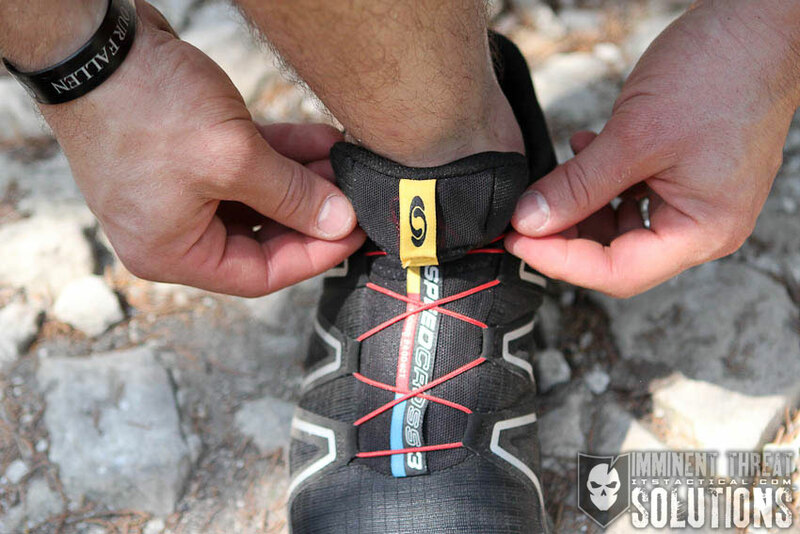 Similar to the Salomon Quicklace system, you grasp a pull tab and pull down on a toggle to lock the lace to your desired tightness. 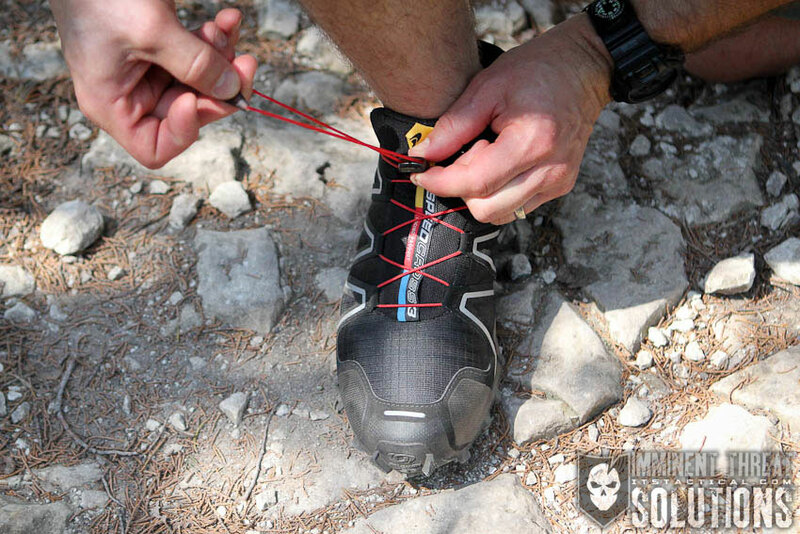 Instead of a pocket on the tongue to stuff the extra lace into like the Salomons feature, there’s a strap of elastic near the toe of the shoe that you tuck the excess lace under. I’m less than impressed with this feature, as the weight of the pull tab causes the extra lace to fall out of the end of the shoe and you get a nice flopping lace that gets quite annoying. In all honesty I don’t usually notice it when running, it’s mostly when walking. 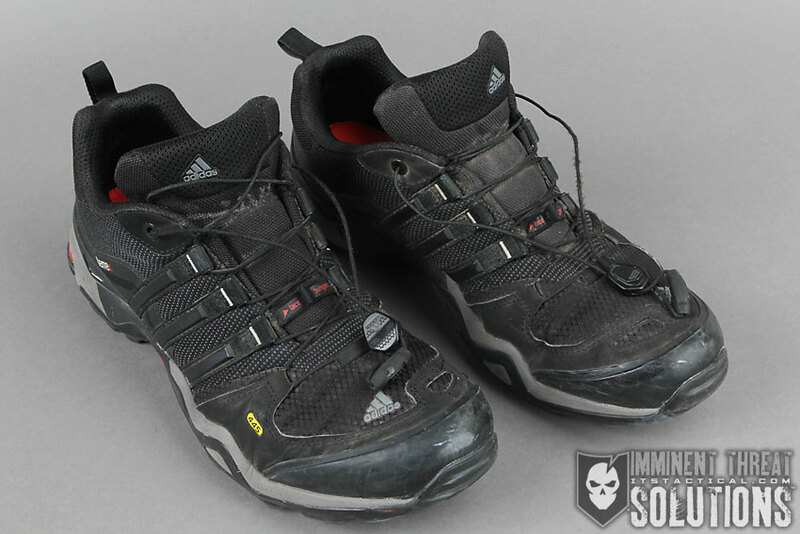 The other issue is that the kevlar laces in the Adidas Terrex shoes are getting severely worn out. The sheath is starting to fray quite a bit and there’s even a place in the sheath where the yellow kevlar underneath is starting to come through. I’m positive that Adidas is using an inferior sheath yarn compared to what Salomon uses and the issue is getting worse. 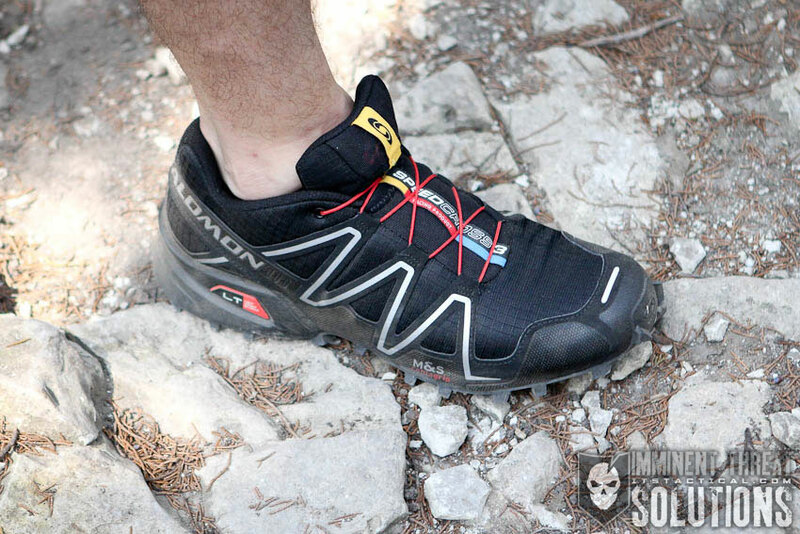 The sheath fraying was never even once an issue with any pair of Salomons I had. 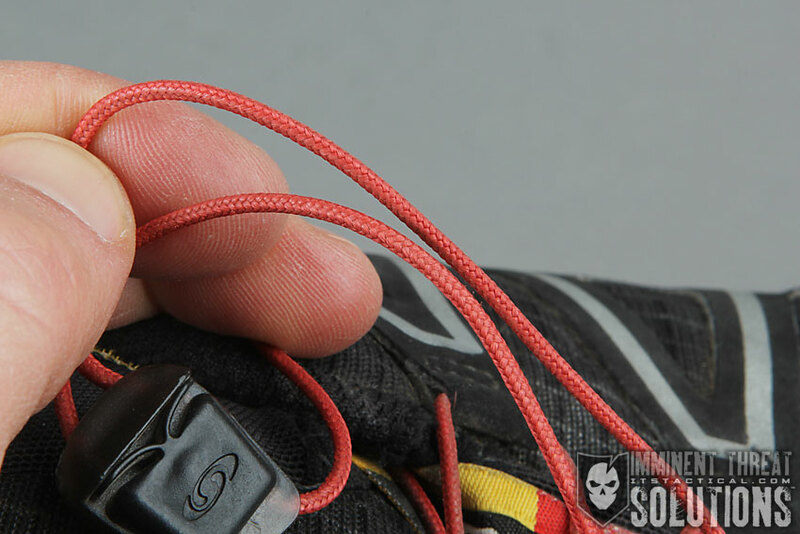 Adidas counters the lace squeaking and creaking Salomon Speedcross shoes have by putting a plastic insert into their lace eyelets, like the Salomon XA Pro has. I haven’t noticed any issues with my Adidas laces making noise. Something more I’d like to add is that the pair of Adidas Terrex Fast X shoes weigh 34 ounces and are considerably heavier than the Salomon Speedcross shoes, but only four ounces more total than the Salomon XA Pro. The overall point I’d like to make is that I’ve found that there’s been trade-offs in moving away from Salomons. I’m not sure that I’m going to buy more Adidas when the pair I have wears out, but I’ll make that decision when the time comes. I’m just hoping my laces last as long as the tread does. As an aside, all the Salomons and Adidas shoes I’ve mentioned here are made overseas. The only US made running shoes that I know of, are specific New Balance styles. If you’re wondering about the history of Salomon and Adidas, they used to be the same company and referred to as Adidas-Salomon until Amer Sports acquired the Salomon brand from Adidas in 2005. Amer Sports also acquired Arc’teryx in the same deal that brought them Salomon. Adidas-Salomon had acquired Arc’teryx in 2001 and thus they went with Salomon when it was sold. Amer Sports also owns Suunto, Wilson, Precor, Atomic and Mavic. I hope you’ve gotten something out of the information I’ve presented here on Salomon Speedcross, Salomon XA Pro 3D Ultra and Adidas Terrex Fast X shoes. I’m still on the hunt for the perfect shoe, but I’m not sure I’ll ever find something that fits my wants across the board.